Photo - Top of the loch flooding. From the club archives in 1935 it was reported that over 300lbs of Pike had been netted from the loch o the Lowes over the season with the aim of allowing Brown Trout to establish themselves. A hundred years ago no Trout were present in the Lowes, but over the years they have gradually moved in, the thinking at that time was kill the predators! However we live in more enlightened times and such actions no longer take place thank god! Also in 1937 a club member was thanked for stocking the loch o the Lowes with a good quantity of water snails over the season in an effort to maximise the feeding for the Brown Trout. In these times the emphasis was firmly on Brown Trout, all other species being viewed as vermin! It was also possible at this time for club members to book a day’s fishing (for Trout of course) and book a boatman to row them all over the loch in search of the Trout. The boatman was the loch keeper at the time. Before you ask we no longer offer this service! Information these days is often easy to source on the internet; much of it however is general and superficial in nature. More intense study into the real issues that affect us as anglers are often glossed over. Much of the time only abstracts of scientific papers (using Google scholar) are available which invariably gives half a story. We have been mulling over the idea that we as a club should subscribe to a vendor of scientific publications such as Wiley Inter Science. Subscribing to such a body would give us (all club members) access to the latest scientific papers in order that we may research our sport and progress the art of angling. It would work on the basis of any member seeking an article would on obtaining the password be able to review in full the latest papers on the topic of interest. Obviously this would cost us in monetary terms but in the long run it may be of benefit to the club. We will keep you informed of our discussions. If any members have any views on this please write in and let us know. A load of back issues of Pikelines the excellent informative magazine distributed to PAC members will be kept in the club boathouse. There is something in these publications for everyone! A few copies of “Pish Talk” the magazine from our good friends Region 52 PAC are also available. These mags contain topics from the serious to the completely bizarre! If you have read one you will know what I mean. Eat your heart out Viz! Any member looking for a good light-hearted read should contact a committee member. A return received from a Mr David P who was fishing the loch recently – “No catch but an enjoyable days fishing”! Indeed such a comment could only come from a real angler who is able to take something from a day’s fishing even when the fish don’t want to play! It’s really heartening these days to know anglers of this ilk are present in numbers it somewhat lightens the load of dealing with the ever present jackal that we encounter. Three lads who braved the deluge today were Scott, Scott and Tony all members of the PAAS and a credit to that organisation. Spent a good while speaking with them as it became clear very quickly these were Pike anglers as they should be. They fired questions at me machine gun style, their thirst for knowledge about the lochs unquenchable. Three lads cast from the mould of a real angler if only more were so! It was a dreadful day weather-wise lads and you had nothing when I spoke to you, hope you managed to get something in return for you endurance. Look forward to meeting you again and gleaning from you some more of your extensive knowledge. A pleasure meeting you! Members Stevie Nimmo and his mate Kris Olson came down for a go at the Pike. Now Kris is a relative newcomer to the sport and has only recently been trying in earnest for a croc. Well in spite of the weather he managed an eight pounder in fine fettle, his first from The Silent Loch! No Dangerman antics here such as unhooking on sharp stones, weighing by the chin, poncing around starving the fish of oxygen and strongly pulling the poor creature in all manner of directions! No simply an enquiring attitude based on the need for sustainable angling and a thirst for knowledge on old Esox under the watchful eye of experienced angler Stevie. Yes just another real angler in the making. Well done Kris! Comments continue to flood in and our readership figures reach an all time high as he comes to the attention of more and more decent Pike anglers. I thought that today would be a day free of his name being mentioned but no such luck! People (anglers and local residents) wanted to know if he was for real with comments such as “nobody could be that stupid” and “can he not see the damage he is doing to angling?” Believe me he is for real and probably the most despised “angler” in the country! 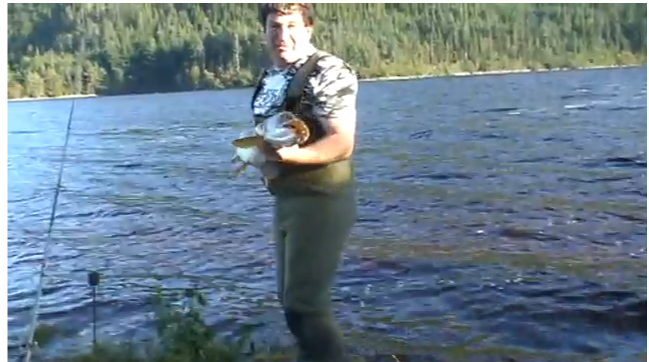 There was unbridled astonishment that he was unable to comprehend that his contritionary juvenile prattle below the video means nothing, as in the video he shows off to a worldwide audience (mainly our readers) reprehensible Pike handling techniques that shame anglers everywhere! All anglers I have spoken to would be ashamed to be seen injuring Pike like he does in the video, moreover they would immediately remove the horror video and pull out all the stops to make a new video showing excellence in handling! He is unable to understand such a simple concept! ANGLING IS AT SEVERE RISK WITH THIS FOOL ON THE LOOSE! Some anglers are now distributing his photo, crime sheet and a link to our news pages to managers of fishing venues. This is a great and right thinking service to angling, your peers are in your debt! Photo – Dangerman a grave risk to the sport of angling! Click the above link to find out how NOT to handle Pike; the perpetrator of the shocking handling in the video has been barred from fishing at our lochs! Have a look at the video and the dopey comments below, he has removed 23 comments from the video all 100% negative (mail us if you would like to view them).